I have always thought that apart from the big five (tiger, lion, jaguar, leopard, cheetah), all other members of the cat family were not as rare nor endangered. I was doing my daily reading this morning when I stumbled upon a webpage that talks about the seven threatened cat species you may not know. None of the big five got on the list, and there was one particular cat that caught my attention; one that doesn't have a picture (yes, it's that rare). 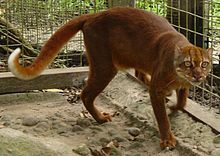 It's called the Bornean Bay Cat Catopuma badia. A quick browse at the webofknowledge further accentuated the cat's rarity--there are only two papers published on this subject. By the way there are pictures of bay cat available in one of the papers. All the pictures were taken by one of the researchers Jim Sanderson. According to the papers, the bay cat is indeed one of the rarest (or most elusive?) felids in the world. This enigmatic creature is so rare that even experienced local hunters whom when interviewed were able to identify four out of five species of Bornean felids couldn't identify the species. Camera traps set up by Mohd Azlan and Jim Sanderson yielded only one photograph of a bay cat in 5034 trap nights. 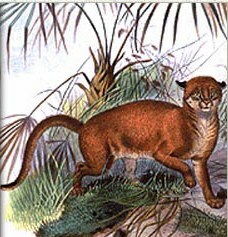 The feline was first discovered by Alfred Russell Wallace in 1855, and was named and described by Gray in 1874. The animal is roughly similar in size to a common house cat. It has a small, rounded head and small, rounded, widely set ears. 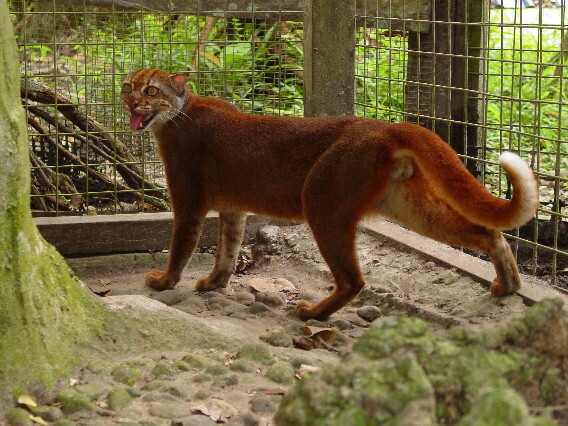 The cat has two colour phases: a reddish bay coat similar to that of Temminck's golden cat and a dark grey coat. The body and legs are long and thin, but its feet appear to be large, which suggests that the animal thrives in a water-rich environment. In fact, 11 of the 15 recorded sightings from 2003 to 2005 were made near a river. 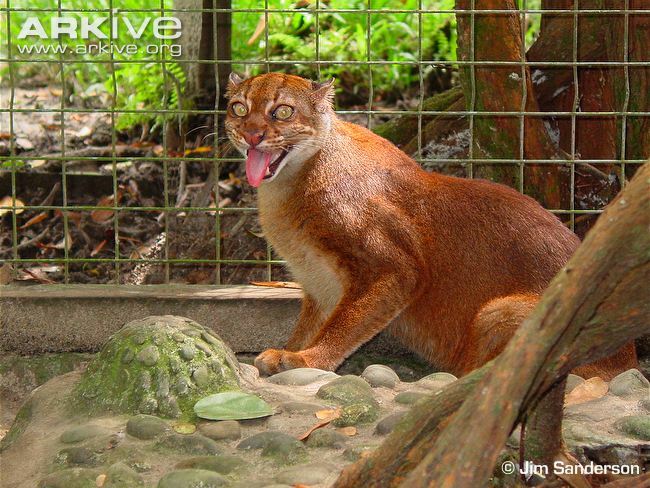 The only bay cat officially kept in captivity was an adult female bay cat in the Semenggoh Wildlife Rehabilitation Center, Kuching, Sarawak. The cat was confiscated during a failed smuggling attempt. It died of pneumonia in 2003 and the carcass was incinerated. The animal is currently listed in Appendix II of CITES (2007). One could argue that the conservation status of this species is unsubstantiated because the actual number might not be that low, since one could have easily overlooked this shy, stealthy creature. But anecdotal evidence from experienced hunters who had observed the species in the wild suggests that the bay cat has become increasingly difficult to detect. It receives little conservation attention because it needs to compete for conservation attention with more charismatic species, though the absence of a spotted coat means that this species is unlikely to be a target for the fur trade. Nevertheless, the lack of coverage on this creature means that we could lose it anytime, and it could go extinct without us even noticing.